The domain within your query sequence starts at position 298 and ends at position 340; the E-value for the HX domain shown below is 4.56e-9. 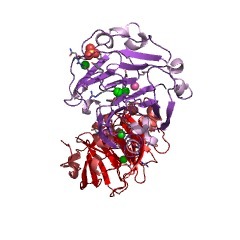 Hemopexin is a heme-binding protein that transports heme to the liver. 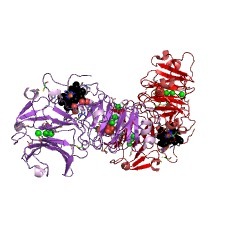 Hemopexin-like repeats occur in vitronectin and some matrix metalloproteinases family (matrixins). 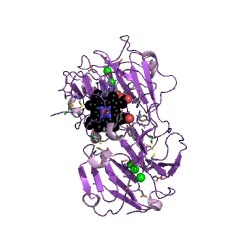 The HX repeats of some matrixins bind tissue inhibitor of metalloproteinases (TIMPs). 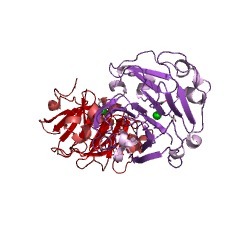 Hemopexin (EC 3.2.1.35) is a serum glycoprotein that binds haem and transports it to the liver for breakdown and iron recovery, after which the free hemopexin returns to the circulation [(PUBMED:12042069)]. Hemopexin prevents haem-mediated oxidative stress. 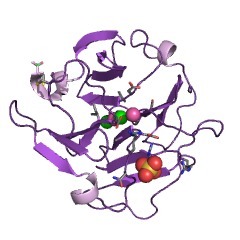 Structurally hemopexin consists of two similar halves of approximately two hundred amino acid residues connected by a histidine-rich hinge region. Each half is itself formed by the repetition of a basic unit of some 35 to 45 residues. 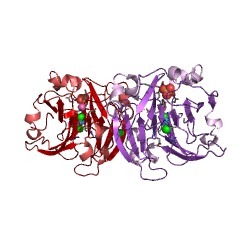 Hemopexin-like domains have been found in two other types of proteins, vitronectin [(PUBMED:9572850)], a cell adhesion and spreading factor found in plasma and tissues, and matrixins MMP-1, MMP-2, MMP-3, MMP-9, MMP-10, MMP-11, MMP-12, MMP-14, MMP-15 and MMP-16, members of the matrix metalloproteinase family that cleave extracellular matrix constituents [(PUBMED:14619953)]. 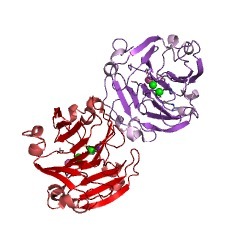 These zinc endopeptidases, which belong to MEROPS peptidase subfamily M10A, have a single hemopexin-like domain in their C-terminal section. 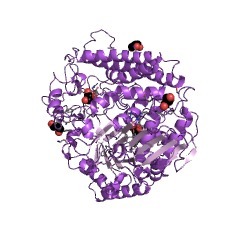 It is suggested that the hemopexin domain facilitates binding to a variety of molecules and proteins, for example the HX repeats of some matrixins bind tissue inhibitor of metallopeptidases (TIMPs). The hemopexin domain exhibits the shape of an oblate ellipsoidal disk. The polypeptide chain is organised in four beta-sheet (blades) I to IV, which are almost symmetrically arranged around a central axis in consecutive order, giving rise to the formation of a four-bladed propeller. Each propeller blade or repeat is made up of four antiparallel beta-strands connected in a W-like strand topology, and is strongly twisted [(PUBMED:8969305), (PUBMED:20147493)]. This entry represents the repeats found in hemopexin and related domains. There are 32767 HX domains in 8777 proteins in SMART's nrdb database. Taxonomic distribution of proteins containing HX domain. This tree includes only several representative species. 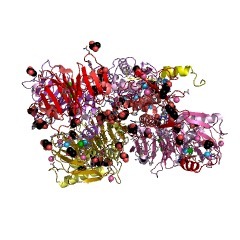 The complete taxonomic breakdown of all proteins with HX domain is also avaliable. Click on the protein counts, or double click on taxonomic names to display all proteins containing HX domain in the selected taxonomic class. Disruption of angiogenesis by PEX, a noncatalytic metalloproteinase fragment with integrin binding activity. Angiogenesis depends on both cell adhesion and proteolytic mechanisms. In fact, matrix metalloproteinase 2 (MMP-2) and integrin alphavbeta3 are functionally associated on the surface of angiogenic blood vessels. 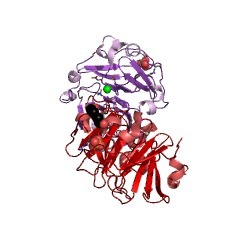 A fragment of MMP-2, which comprises the C-terminal hemopexin-like domain, termed PEX, prevents this enzyme binding to alphavbeta3 and blocks cell surface collagenolytic activity. PEX blocks MMP-2 activity on the chick chorioallantoic membrane where it disrupts angiogenesis and tumor growth. Importantly, a naturally occurring form of PEX can be detected in vivo in conjunction with alphavbeta3 expression in tumors and during developmental retinal neovascularization. Levels of PEX in these vascularized tissues suggest that it interacts with endothelial cell alphavbeta3 where it serves as a natural inhibitor of MMP-2 activity, thereby regulating the invasive behavior of new blood vessels. 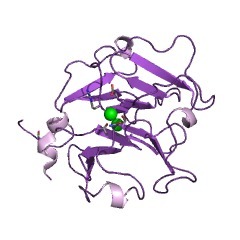 Specific, high affinity binding of tissue inhibitor of metalloproteinases-4 (TIMP-4) to the COOH-terminal hemopexin-like domain of human gelatinase A. TIMP-4 binds progelatinase A and the COOH-terminal domain in a similar manner to TIMP-2. 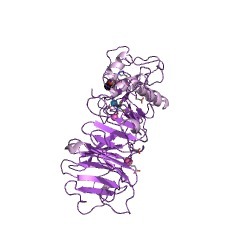 The binding properties of the newly described tissue inhibitor of metalloproteinases-4 (TIMP-4) to progelatinase A and to the COOH-terminal hemopexin-like domain (C domain) of the enzyme were examined. 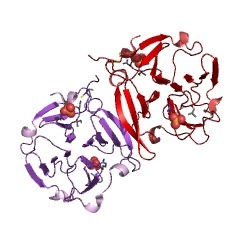 We present evidence for the first time of a specific, high affinity interaction between TIMP-4 and the C domain of human gelatinase A and show that TIMP-4 binds both progelatinase A and the C domain in a similar manner to that of TIMP-2. Saturable binding of recombinant C domain to TIMP-4 and to TIMP-2 but not to TIMP-1 was demonstrated using a microwell protein binding assay. 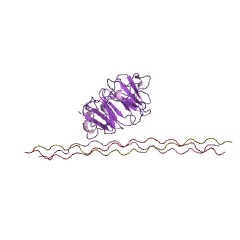 The recombinant collagen binding domain of gelatinase A, comprised of the three fibronectin type II-like repeats, did not bind to TIMP-4, indicating that binding is mediated selectively by the C domain. Binding to TIMP-4 was of high affinity with an apparent Kd of 1.7 x 10(-7) M but slightly weaker than that to TIMP-2 (apparent Kd of 0.66 x 10(-7) M). Affinity chromatography confirmed the TIMP-4-C domain interaction and also showed that the complex could not be disrupted by 1 M NaCl or 10% dimethyl sulfoxide, thereby further demonstrating the tight binding. 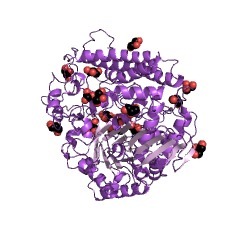 To verify the biological significance of this interaction, binding of full-length progelatinase A to TIMP-4 was investigated. 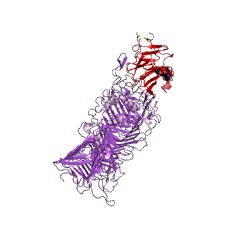 TIMP-4 and TIMP-2 but not TIMP-1 bound specifically to purified TIMP-2-free human recombinant full-length progelatinase A and to full-length rat proenzyme from the conditioned culture medium of ROS 17/2.8 cells. Preincubation of the C domain with TIMP-2 was found to reduce subsequent binding to TIMP-4 in a concentration-dependent manner. 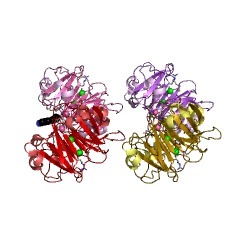 Competition between TIMP-2 and TIMP-4 for a common or overlapping binding sites on the gelatinase A C domain may occur; alternatively TIMP-2 may prevent the binding of TIMP-4 by steric hindrance or induction of a conformational change in the C domain. 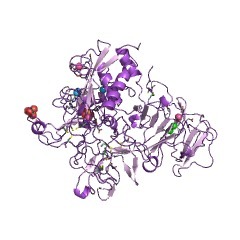 We propose that the binding of progelatinase A to TIMP-4 represents a third TIMP-progelatinase interaction in addition to that of progelatinase A with TIMP-2 and progelatinase B with TIMP-1 described previously. 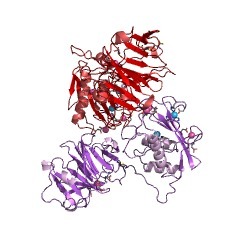 This new phenomenon may be of important physiological significance in modulating the cell surface activation of progelatinase A.
Mutational study of the amino-terminal domain of human tissue inhibitor of metalloproteinases 1 (TIMP-1) locates an inhibitory region for matrix metalloproteinases. A bacterial expression system for the inhibitory N-terminal domain of human tissue inhibitor of metalloproteinases 1 (N-TIMP-1) (Huang, W., Suzuki, K., Nagase, H., Arumugam, S., Van Doren, S. R., and Brew, K. (1996) FEBS Lett. 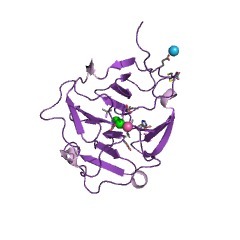 384, 155-161) has been used to produce 20 single- and double-site mutants that probe the roles of different residues in its inhibitory action on metalloproteinases. 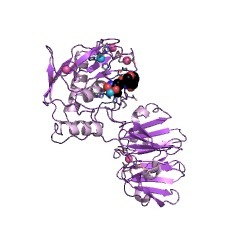 Mutations that produce the largest increases in the Ki for a C-terminally truncated form of stromelysin 1, MMP-3(DeltaC), but do not disturb the conformation involve substitutions of residues that are located in a ridge that is centered around the disulfide bond between Cys1 and Cys70. Specific residues that have a large influence on activity include Cys1, Thr2, Met66, Val69, and Cys70. Of the mutations introduced, the greatest functional disturbances, reflected in Ki increases of 2-4 orders of magnitude, are generated by changes that disrupt the Cys1-Cys70 disulfide bond and by substitution of Ala for Thr2. Most mutations that perturb the interaction with MMP-3 have parallel effects on the affinity of N-TIMP-1 for MMP-1 (interstitial collagenase) and MMP-2 (gelatinase A). However, the Thr2 to Ala mutation produces an inhibitor that is 17-fold more effective against MMP-3 than MMP-1, suggesting that it is feasible to engineer TIMP-1 variants that are more specifically targeted to selected matrix metalloproteinases. The reactive site identified by these studies is a structurally constrained but elongated region of TIMP that can fit the matrix metalloproteinase substrate-binding site. 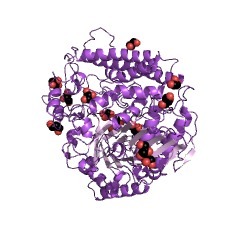 Relating matrix metalloproteinase structure to function: why the "hemopexin" domain? 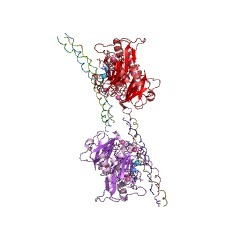 Matrix metalloproteinases are thought to be key players in the remodelling activity of cells associated with both physiological and pathological processes. They share a relatively conserved structure with a number of identifiable modules linked to their specific functions. 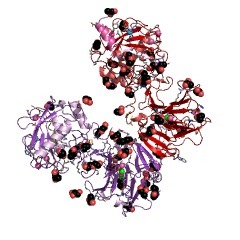 The structure of the individual domains of a number of matrix metalloproteinases have now been elucidated. Here we review these data in the light of complementary studies on the behaviour of these enzymes in biological systems. 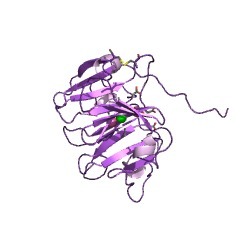 In particular we focus on the C-terminal hemopexin-like domain which has intriguingly specific roles in individual matrix metalloproteinases. 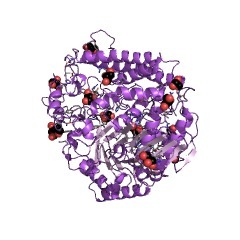 The helping hand of collagenase-3 (MMP-13): 2.7 A crystal structure of its C-terminal haemopexin-like domain. 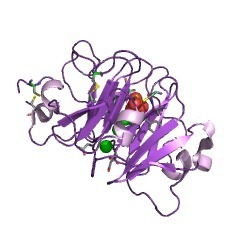 Collagenase-3 (MMP-13) is a matrix metalloproteinase involved in human breast cancer pathology and in arthritic processes. The crystal structure of its C-terminal haemopexin-like domain has been solved by molecular replacement and refined to an R-value of 0.195 using data to 2.7 A resolution. This structure reveals a disk-like shape. The chain is folded into a beta-propeller structure of pseudo 4-fold symmetry, with the four propeller blades arranged around a funnel-like tunnel. This central tunnel tube harbours four ions assigned as two calcium and two chloride ions. The C-terminal domain of collagenase-3 has a similar structure to the equivalent domain of gelatinase A and fibroblast collagenase 1; however, its detailed structure and surface charge pattern has a somewhat greater similarity to the latter, in agreement with the subgrouping of MMP-13 with the collagenase subfamily of MMPs. 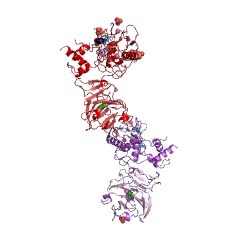 It is proposed that several small structural differences may act together to confer the characteristic binding and cleavage specificities of collagenases for triple-helical substrates, probably in co-operation with a fitting interdomain linker. 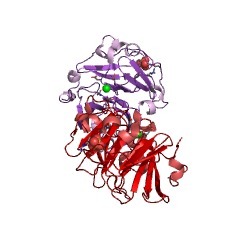 Homology with hemopexin suggests a possible scavenging function for S-protein/vitronectin. 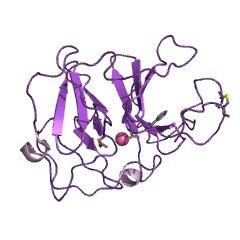 S-protein is an abundant plasma protein which has recently been shown to be identical to vitronectin and serum spreading factor [(1985) EMBO J. 4, 3153-3157]. 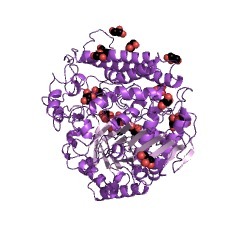 It therefore has multiple binding sites for terminal complement complexes, thrombin-antithrombin III, heparin, and a specific cell receptor. 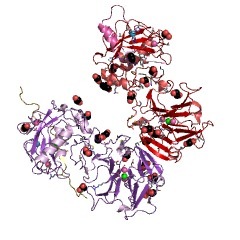 In this report a structural and sequence homology with hemopexin is described which suggests that the principle function of S-protein could be as a scavenging molecule, clearing spent complement and coagulation complexes from the circulation. This information is based on mapping of SMART genomic protein database to KEGG orthologous groups. Percentage points are related to the number of proteins with HX domain which could be assigned to a KEGG orthologous group, and not all proteins containing HX domain. Please note that proteins can be included in multiple pathways, ie. the numbers above will not always add up to 100%. 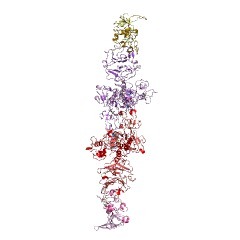 2clt Crystal structure of the active form (full-length) of human fibroblast collagenase.